The first days of summer have proven one thing. There is a heat wave among us. Triple digit temperatures are burning up the southwest and making its way across the nation. In Phoenix, one flight was forced to return to the runway due to high temperatures. 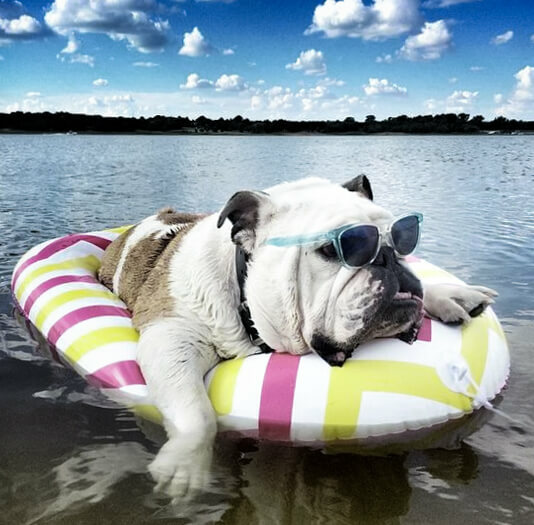 We all know how to cool ourselves down but do you know how to keep your bully cool? Go for a walk late at night or early in the morning. Cesar Milan knows his stuff when it comes to dogs. On his blog, Cesar’s Way, his number one tip is to change your walking schedule. During the summer, the temperature peaks in the mid to late afternoon. Taking a walk in the early morning is a great way to start your day. The temperature is mild and the birds are chirping. One of the best things about walking your dog is that it tires them out. A tired bulldog is less likely to misbehave if you work during the day. A late evening walk is also beneficial because the temperature has dropped. It helps you and your dog to unwind after a long day. It allows you to nurture the bond you have. It also tires you and your dog for a more restful night of sleep. Frozen treats are a dog’s best friend. Clare Lower over at dogster.com has a great tip on cooling your dog down. Responsible dog owners know that human ice cream is bad for their furry friends. Any milk-based food can cause intestinal problems. You can make your own doggie ice cream, sans milk. Frozen popsicles made of beef or chicken broth are an easy alternative. You can use store bought broth but make sure it is low sodium. You can also cut up some cucumber that has been cooled in the fridge. It is a quick and simple treat that will keep your bulldog hydrated. Doggie smoothies are another cold treat to beat the heat. The wonderful people at BarkPost have compiled a list of smoothies you can enjoy with your pup. Your dog has to be outside at some point during the day. Again, Clare Lower has an excellent way to make it more comfortable for your dog. Her advice is to make sure to create a space that is shaded. You can use a sports umbrella or a small tent. If your yard has any trees, you can set up space near the trunk. A fun way to keep them cool outside is to have a kiddie pool set up. Dogs get cooler from the ground up. Getting their feet and bellies to cool down can lower their overall body temperature. They can cool off and splash around at the same time. Air conditioning is a luxury that is beneficial to the bully breeds. If you aren’t able to have that luxury, evaporator coolers and window air cooling units are great cost effective options. If you are on a budget, place a pan of ice in front of a fan and bask in the cool air. The team at bulldogsworld.com included this great tip on their site. You can also place their bed and toys in the stream of cool air. Their coats may be short but they are insulators against the cold. By running your fingers through their fur, you can help the cool air get to their skin more effectively. A hot car is a no-no. With the heat wave settling in, it’s not just the outdoor temperature that is a concern. The folks at petfinder.com explain that on a warm day, inside a parked car can reach 120 degrees within minutes. According to the American Veterinary Medical Association, 15 minutes is enough to kill a pet. In an article at the huffingtonpost.com, they presented the AVMA’s scientific proof. In just 10 minutes, the temperature inside a parked car rose 19 degrees. They also stated that cracking the windows does not efficiently decrease the temperature rise. Bulldogs already have difficulty maintaining their body temperatures. By leaving them in a hot car, they are at risk of brain damage. They can also die from suffocation or heat stroke. If your trip to the grocery store is only for a few things, leave your bulldog at home. Summer is here to stay for a couple more months at least. 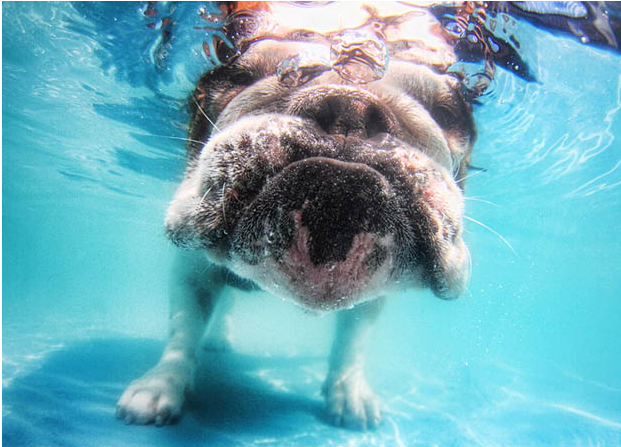 With these tips and tricks, your bulldog will be able to stay cool and happy. 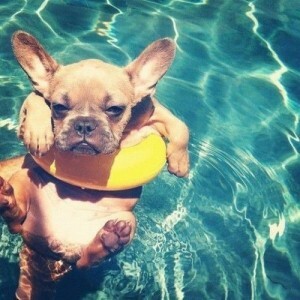 Don’t be afraid to enjoy these summer days in the sun. Staying attentive and proactive is the best chance your dog has of enjoying the summer too.